When you are running to keep up with the fast pace of life you need to cook first too. It is true when you are running around to reach office at the right time or preparing kids for school you need to cook fast too. You can’t compromise with the food value. And you shouldn’t either. But how you will be able to accomplish the mission? Pressure cooker manufacturers are coming up with different types of products that can not only suit your demand but also will make cooking an easier and fun process. You must be thinking why you should resort to a pressure cooker and what benefits does it offer. Take a look. As while cooking in a pressure cooker the food and the nutrients remains trapped in an enclosed place, it retains most of the food value. In the case of stove top cooking most of the nutrients gets evaporated with the steam. But for pressure cooking the story is totally different. Stove top cooking in an open pan takes quite a lot of time. As the heat evaporates with time in an open pot it remains trapped in a pressure cooker. When you are cooking in an induction based pressure cooker the trapped heat in the utensil makes the cooking process faster. Was in the case of pressure cooking there are little chance of spilling the juice on the stove top the kitchen remains clean. On the other hand the heat remains enclosed and that make sure that you can cook in a much cooler place. 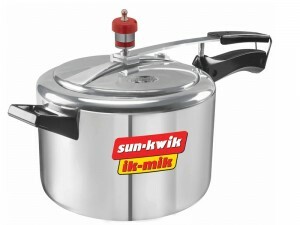 Since now you know there are so many benefit of pressure cooker why are you still pondering over the safety? Let me tell you, the reputed companies now ensure that the safety controls are at place when you are buying a pressure cooker. Cook healthy, eat healthy and stay healthy.